If there’s one thing we can be certain about in this industry it’s the uncertainty of fuel prices. Anybody who’s ever filled up the car before a long weekend knows that spikes in fuel prices are to be expected. 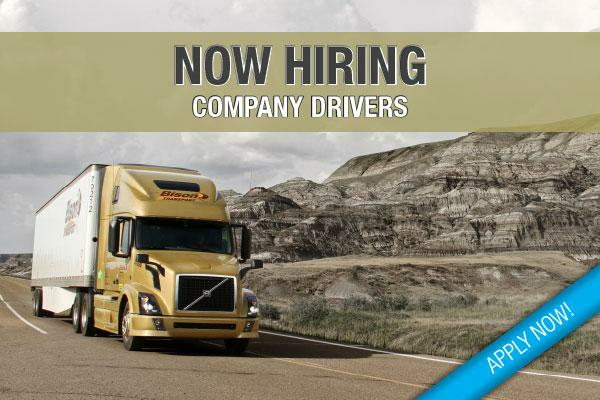 And for everyday driving, the trucking industry feels any price fluctuation much harder. According to Natural Resources Canada, diesel prices are at their highest since 2015. Regardless of fuel prices, we have a never-ending focus on increasing fuel economy and reducing GHG (greenhouse gas) emissions. As you will see below, Bison’s MPG (miles per gallon) performance has improved year over year, and those results are a clear function of investing in new equipment and tools, driver training, and providing fuel advice for our professional drivers. We track our overall MPG performance across the board, by fleet, by tractor type, by tractor age, by lane and region and even by driver. We also track the temperature based on our 10 most-driven regions, since temperature has a large impact of fuel economy. As a result, every carrier likely experiences different numbers based on the make-up of their lanes, equipment, and driver behaviour. It is important to know that improving MPG is the right thing to do for many reasons, but it often does not offset the investments needed by carriers. Tractor manufacturers such as Freightliner or Volvo, promote that their tractors can provide improved MPG, right out of the gate. 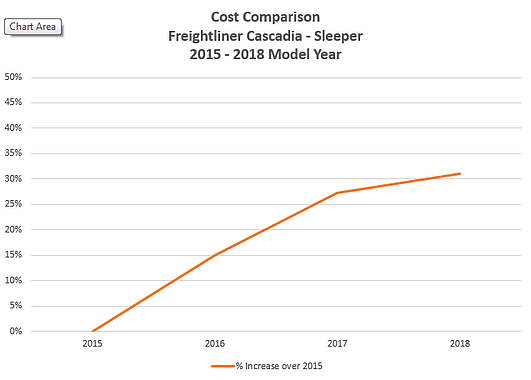 For example, Freightliner states, "Fuel efficiency is said to be eight per cent better than the current Evolution model and a whopping 13 per cent better than the base-model Cascadia." So, while there will be less fuel consumed, a carrier has to offset those savings with increased tractor costs. Compared to the base model Cascadia on the road today, a 2018 Cascadia that leverages all available aerodynamic and power-train enhancements will cost another $15,000 but boost fuel economy by 19 per cent, said Martin Daum, president and CEO of Daimler Trucks North America. In addition to tractors, Bison has invested in Trailer Tails, building the largest turnpike LCV (long-combination vehicle) network in North America, trailer skirts. Note: This chart shows just one representative example of rising equipment costs. The model years roughly reflect our fiscal period from 2014 to 2017 (i.e. the actual purchase of a 2015 model would have occurred in fiscal 2014). Driver training provides a second example of this. We have our drivers train in our simulator and teach skills that directly improve MPG, such as increased coasting, limiting idle time, etc. So once again, MPG increases but can be offset by the additional costs to invest in training. Pro Tip: When you are in motion, operate in top gear whenever possible. The best fuel economy happens in high gear, not one gear down. For trucks with manual transmissions, use progressive shifting techniques and stay in the “sweet spot.” With automated transmissions, use manual settings to optimize fuel-saving behaviours. We have greatly reduced our idle time over the past few years. This would not be possible, or at least as likely, if Bison hadn’t invested in having APUs (auxiliary power units) in every unit. We run small diesel-powered heaters and battery-operated cooling systems in our fleet. This makes the tractor more comfortable and eliminates the need for idling. Many carriers choose to not make this investment, which increases GHG but also puts their drivers at risk of being ticketed in certain regions. Pro Tip: Idling is a surefire way to unnecessarily burn fuel. Keep your idle time to a minimum. Research shows that each hour of idle time can decrease fuel economy by one per cent. Check your tire pressure. Did you know that each 10 psi that a truck/trailer tire is under inflated can also reduce fuel economy by one per cent? We always recommend checking your tires before heading out on the road but it is also a great cost-saving measure. Do a hammer check on every tire and ensure recommended pressure levels are maintained at all times. If any tires need adjustment contact your local maintenance team. In summary, many factors improve MPG and Bison will continue to innovate and educate our fleet and the industry about how we can collectively improve MPG and reduce GHG emissions. While improving our MPG doesn't create a windfall, driving more efficiently and leveraging technology has produced long-term, sustainable, transportation solutions at a competitive rate. Now it’s your turn. What do you feel are the greatest opportunities to improve MPG? Please comment below. If It Costs Me Less To Fill Up My Car In Western Canada, Why Is My Fuel Surcharge Increasing?